Lingering leaves are always good for catching the inevitable December ice events. Above, the clinging (marcescent) foliage of Japanese emperor or daimyo oak (Quercus dentata); below, Blackbird spurge (Euphorbia ‘Nothowlee’). Looking at past pictures of grasses makes me miss them terribly this time of year. Pony tail grass, also called Mexican feather grass (Stipa tenuissima), is one of my favorites all year round. Little bluestem (Schizachyrium scoparium) is another one of my favorites, mostly for fall and winter interest. Above are two seedling clumps in the meadow; below is the cultivar ‘The Blues’, with orange coneflower (Rudbeckia fulgida) seedheads. …‘Indian Steel’ Indian grass (Sorghastrum nutans) with purple coneflower (Echinacea purpurea) seedheads. And oh, do I miss the variety of sturdy seedheads. Below is ‘Mt. Everest’ ornamental onion (Allium). 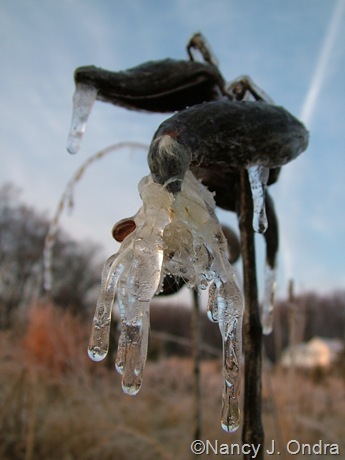 Umbels are especially good at making interesting ice sculptures. Above is golden lace (Patrinia scabiosifolia); below is Joe-Pye weed (Eupatoriadelphus maculatus). And the spiky racemes of Culver’s root (Veronicastrum virginicum). …and ‘Winter Red’ winterberry (Ilex verticillata). …and coral red ‘Cardinal’ dogwood (also C. sericea). Brrr…that’s enough ice for now. I’m thinking that some summer combinations might be a better subject for winter posts! Brrrrrr all this ice talk and viewing has made me cold. We have snow cover here. I hope you are in the process of thawing out by now. Sorry, Lisa. This would have been much nicer for a July post. The only warmth we have here is from shoveling (and re-shoveling), but at least the sun is out for a change. Fantastic ice pictures:0) Here in Denmark everything is covered of snow! It’s pretty much the same here too now, Lisbeth. Winter has arrived with a vengeance. But there’s hope for spring, too: a bunch of seed catalogs arrived today. If I had big trees like you do, I’d worry about ice too – and the mighty winds we’re having right now as well. I hope all is well for you. At least you have the pictures which are all gorgeous. Fantasy in ice right there. Happy holidays Nan. Thanks for visiting, Layanee. Looks like we might be in for some milder weather soon; hope you get it too. Lovely photos even if its of ice! I want it to be spring now!! Poor Susie – you already have spring fever and it’s just barely winter. Keep your spirits up and look forward to the return of planting season. A minute ago I ordered 2 of your books; Foliage and Fall Scaping. I think these are universial and that I can have good use of them here in Sweden – and I can also enjoy all the lovely pictures of course! How exciting, Susie! I’m delighted and honored. Foliage is my favorite book. I know a couple of other folks in Sweden have gotten it and found it useful (or at least they said they did). Rob’s photos in both books are absolutely gorgeous. Enjoy! Oh Nan. Only you could make winter look so beautiful! Thanks, Marie. Looks like we’ll be back to mud season by this weekend, though! Lovely post, Nan! Our freezing events are few and far between…and rarely do they result in anything so beautiful as these shots. Those dogwoods look like tubes of neon, they are so vibrant, and the Poncirus looks so striking, with that zig-zag pattern! I’m also quite fond of Little Bluestem, it really earns its keep during the winter months, and that shot with the Rudbeckia is stunning, I love how those black seedheads really pop against the warm, muted color of the Bluestem. I’m glad you enjoyed them, Scott. Isn’t it amazing how much the bluestems vary in their winter color? ‘The Blues’ is so coppery in fall but pink in the winter, while the species clumps can be anything from bleach-blond to rich russet. It was sad to mow them down so early, but at least the voles aren’t making homes in them this winter. Simply breathtaking, Nan. I am glad the Stipa/Nasella is hardy for you. I didn’t realize it would be so far north. Hooray for Grasses! It didn’t used to be hardy, but I’ve had increasing success with it overwintering over the last few winters. I usually start a bunch each spring, too, just in case. I can’t get enough of it! Phenomenal photographs! It is as if the plants are all just frozen in time. I have a vole problem too.I may have to try your approach next winter. Thanks so much, Karin! Aren’t voles horrible? Doing a very thorough garden cleanup this fall, and mowing down the surrounding meadow too, has made a big difference this year. It helps that our ground froze solid quite early too. Beautiful images, Nan, as always. I love the corkscrewing branches of ‘Flying Dragon’ hardy orange in winter. I’m trying Blackbird spurge here with poor results. I only wish mine looked as good as yours, even under ice. We’ll see if ‘Blackbird’ makes it through this winter here, Pam. I’m not holding out much hope; it looks pretty bedraggled now. Nan, That must have been an amazing ice storm because your pictures are simply magical. This fall I had to cut down most of the grasses and perennials that I typically leave standing throughout the winter and now my garden seems naked. We had our first snow fall yesterday and it was strange not to see my miscanthus, agastache or eupatorium sporting snow. It’s funny what we gardeners associate with winter. Sorry to hear that you too had to miss out on the grasses and seedheads this winter, Debbie. It feels like a big part of the gardening year is missing without them. Amazing ice-covered plants, they look so magical like a winter fairyland! Fantastic photos, I love them all! Thank you so much for visiting! I imagine you don’t get to see much ice in your climate. I’d be glad to trade you for some coleus right now. Oh, I got certified too – so you’re saying that we brought the problem on ourselves? Yikes. I do suspect that expanding the meadow so it wraps around the main garden has provided much better vole habitat. So, less mowing but more voles. Hmmm. I know ice can be harsh on a garden, but your beautiful photos just make it seem magical! Thanks, Meredith. Fortunately, the ice is a short-lived phenomenon, but it’s lovely while it lasts. Gorgeous ice pictures!! I know the ice makes treacherous driving conditions, but it sure makes for some pretty pictures!! The ornamental grasses were especially pretty. Quite right, Toni – just like the snow! These are beautiful images of ice covered plants. You really make winter a beautiful season. It’s a gift to be able to see beauty in unexpected places, isn’t it? Still, I wouldn’t mind some lush foliage and colorful flowers right about now! Wow – spectacular photos Nancy.. The winter garden can be a lovely place.. Thanks for sharing these..
Great of you to visit, Niki! Thanks for the comment. Breathaking! Little did I realize that you had so much ice….it looks like you may have another book in the making…. I’m sure you remember how crazy the weather can be here in PA, Fran! We don’t usually get *that* much ice, fortunately! Your dogwood looks nice. I have one covered in scales, so no red, life getting sucked away. Sorry to hear that, Benjamin. Scale can be tough to deal with. Great photos! Looks like Jack Frost went on a rampage! And now, it’s Old Man winter’s turn: everything is all white now. Spring cannot come too soon! awesome images. fortunately, we’ve been light on ice here but have made up for that with plentiful snowfall (worcester hills, mass). i also cut back a winter treat this past fall, all my astilbe flower heads. they’re pretty sturdy and hold up well all winter, providing interest. the problem is that my flower beds are being over run by astilbe. they apparently reseed profusely! Thanks for visiting, Ron. Let’s hope that we’re all done with ice for this year. I don’t have enough shade for astilbe here, but it sounds like you have the perfect conditions for them if they’re reseeding that much!